Louisville, Kentucky – The benefits of saving money and protecting the environment — along with the appeal of having hot water on demand — are driving homeowner interest in upgrading their homes with tankless water heaters. According to a recent survey sponsored by the Propane Education & Research Council (PERC), 60 percent of homeowners said they were interested in installing a tankless water heater during the next five years. The survey, which was conducted by the Opinion Research Corporation, determined that 80 percent of homeowners were concerned about the energy efficiency of their home, with the majority expressing equal concern for saving money and helping the environment. Meanwhile, when asked whether energy efficiency, dependability, or price was most important when considering the purchase of a water heater, 58 percent cited energy efficiency, 27 percent cited dependability and just 12 percent cited price. According to the U.S. Department of Energy, water heating represents up to 15.5 percent of national residential energy consumption. This makes water heating the second largest end use of energy in homes, after heating and cooling. 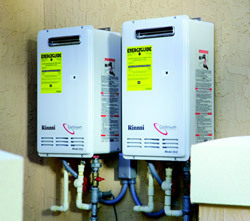 As of January 1, 2009, whole-home gas tankless water heaters qualified for the Energy Star label. Energy Star is a government-backed program that helps builders and consumers identify products that are energy efficient, save money, and help protect the environment. Homeowners living on or off the natural gas main can take advantage of high-efficiency tankless water heating technology. Propane tankless water heaters qualify for the Energy Star rating and produce 63 percent fewer carbon emissions than electric water heaters. Put another way, upgrading a home’s electric water heater to a propane tankless system has nearly the same greenhouse-gas emission impact as does switching a family from a typical midsize sedan to a Toyota Prius. While construction professionals might assume that belt-tightening homeowners care more about the cost of new appliances than potential cost savings, the reverse is true, according to the PERC homeowner survey. When asked how the economy had affected their attitudes toward the energy efficiency of their homes, almost 40 percent of homeowners surveyed said that energy efficiency had become more important to them because of the long-term opportunity to save on energy costs, while only 17 percent said it had become less important because of the cost of making changes to their homes. Meanwhile, 80 percent of homeowners surveyed said they would want to work with professionals with green building or green appliance experience if they were to build a new home or make improvements to their current home.